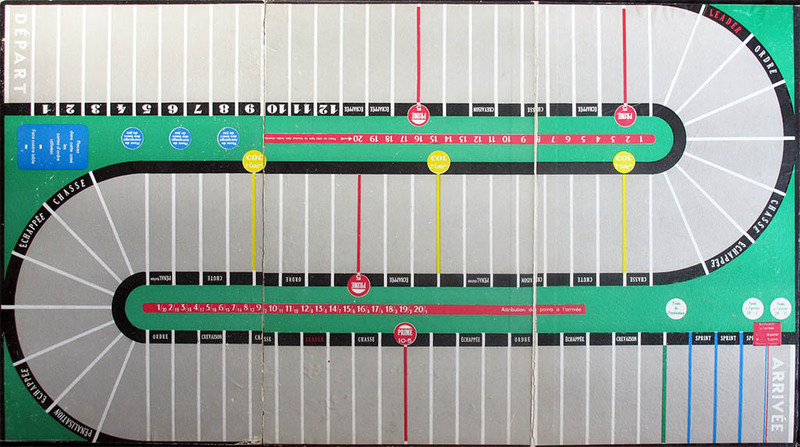 This is a rare French game of which I have never seen another copy. 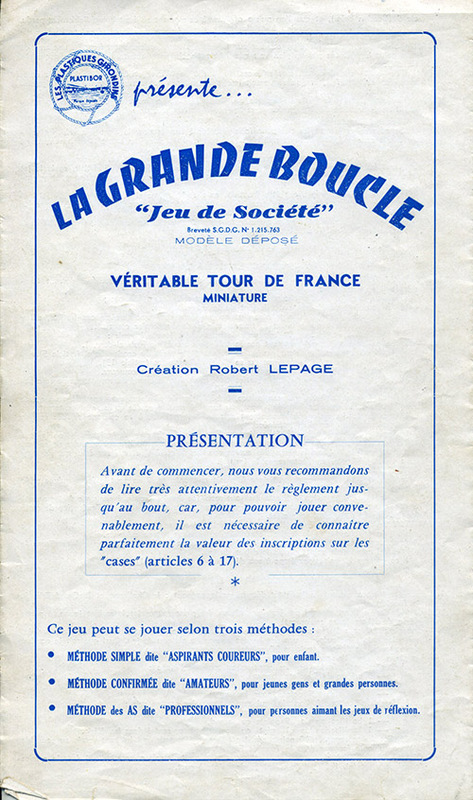 The game was made in Bordeaux and patented in Bordeaux,and probably was only distributed there, although the previous owner told me that he has never seen another copy either, despite living in Bordeaux for many years. ALthough there is a name of a manufacturer (Plastibor), I have never seen another game byhim, so (until proven otherwise) I am including the game in the self-published games category. 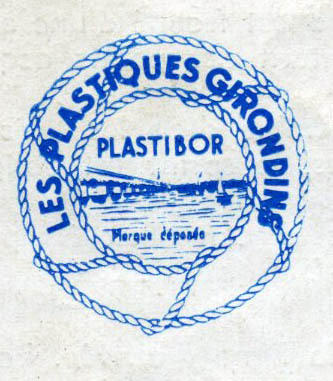 The patent was asked for in 1958, and this is the date I use, though it is probable that the actual manufacturing of the game was somewhat later. 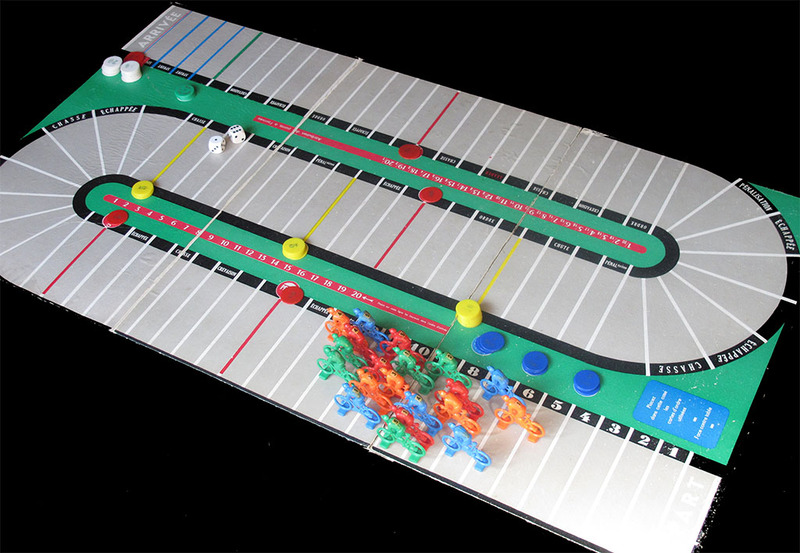 This game represents a stage race and can be played by 2, 3 or 4 people, though of course it is best with 4. The players must previously agree on the number of stages to be run. Since there is only one board, all the stages are similar. The aim of the game is to collect the most points, no matter which rider collects them. Points are awarded not only at the end of the stage, but also on the red ("prime") lines. Furthermore, there is a King of The mountains classification (yellow lines are mountain passes) which will give extra points at the end of the game. However, points are deducted from the team's total when riders falls on squares marked "PÉNALISATION". 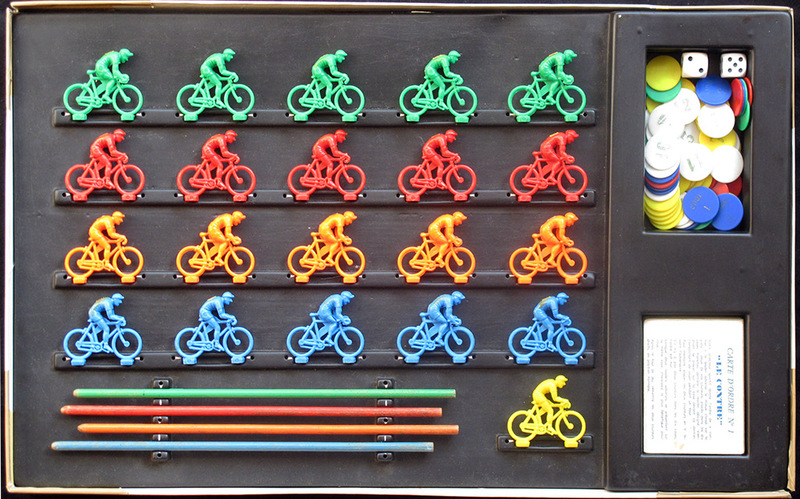 Each player manages a team of 5 riders, numbered 1 to 5, although only the number of the team leader (1) is important. The other riders might as well not be numbered. In each turn the player throws two dice and decides which rider(s) he will move. He can give the total to one rider of move a different rider with each die. It looks quite simple at first sight, but it is not so, since there are some subtleties hidden in the game mechanics. By the way, there are three levels of play, called "ASPIRANTS COUREURS", "AMATEIURS" and "PROFESSIONELS". I will only comment the advanced (proféssionel) rules, the other levels being simpler. Every player receives a set of six cards with "orders fcrom the team director". The 4 sets of cards are identical, and tend to favour having the leader of the team ahead of the other riders. "LEADER" squares also favour the team if the leader is in front. 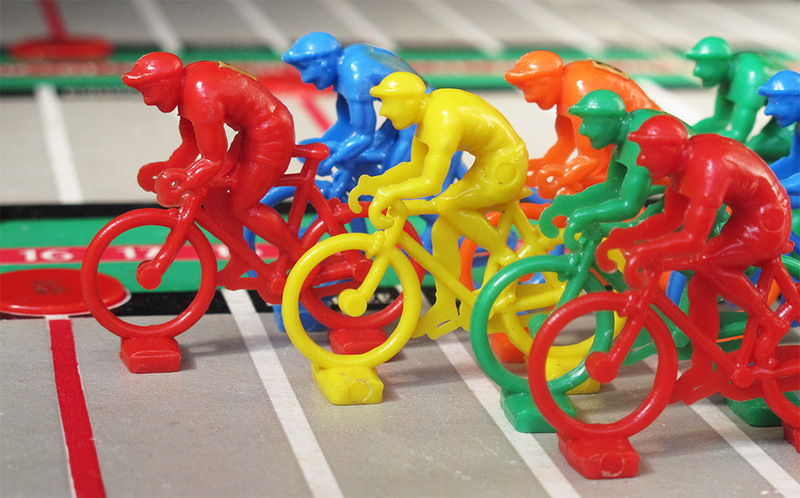 So players will try to have their team leader in the front of the race, even though it is not important which rider in the team crosses the finish line first. Nevertheless, there is a rule that allows a team that has 4 riders on the same square to attack, so the leader must be ahead, but maybe not that much. On the other hand, it is compulsory to move with at least one die the last rider in the race. What is worse, if a rider spends three consecutive game turns in the last position and is unable to overtake at least another rider, he is caught by the broom wagon and must leave the game. He will not take part in the following stages either. 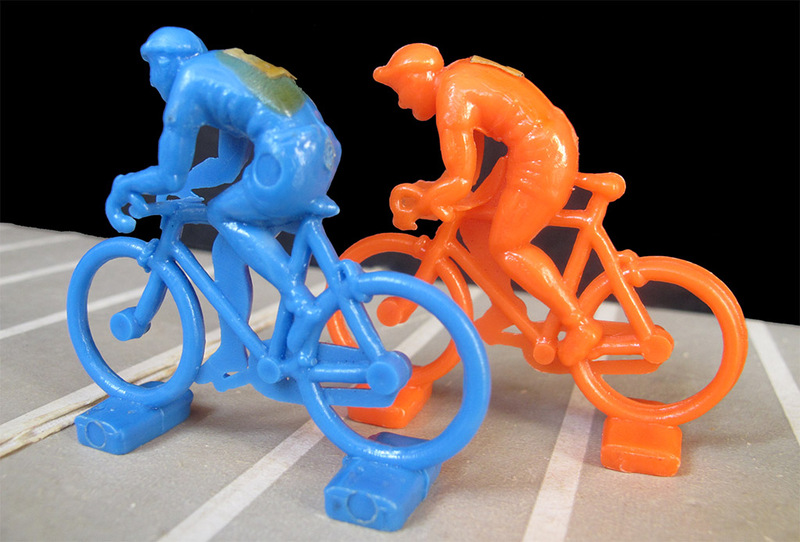 When the first rider crosses the finish line, the two last players in the race (indepoendently of which team they belong to) will also be eliminated if they are not able to cross the finish line in one throw (with two dice). Furthermore, some riders can be eliminated as a consequence of falls. A team that has less of three riders will not start the next stage(s). On the black strip at the side of the road you can read some words: "ÉCHAPPÉE", "CHASSE" , "CHUTE", "CREVAISON, "PÉNALISATION", "ORDRE", "LEADER" and "SPRINT" which of course applyy to the neighbouring square. As you can guess, some of those are good and players will try to place their riders on them while others are not and have to be avoided if possible. Some of these squares ("ÉCHAPPÉE", "CHASSE") cause multiple riders to move. In this case the order in which the dice are played matters, since the riders will end on different squares depending of what die (and for what rider) is played first. There are some examples in the rules of group movements which are not easy to foresee the first time you play this game. The riders are big too, they measure 5 cms from wheel to wheel. There is a yellow rider which will substitute the leader of the race from the second stage on. This is a feature that appears quite often in French games. The 4 wooden sticks are supposed to be used to calculate the squares where riders will fall, instead of touching the board with your sweaty hands or moving the riders "just to see". 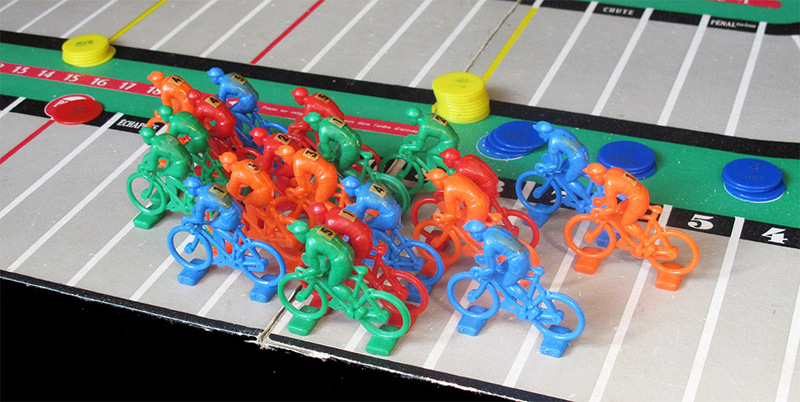 Here you see the game after a few of throws, with a grouped peloton and all the bonus counters in their place. Some riders have lost their number with the years. However, as stated above, it is only important to be able to distinguish the leaders. I am lucky enough to have the four numbers one still on their place. Thus, I do not need to put new numbers on the riders to play the game. Sprint for a 5-point "prime"
Notice that there are two different riding positions: seated and "en danseuse". It is not relevant for the game. 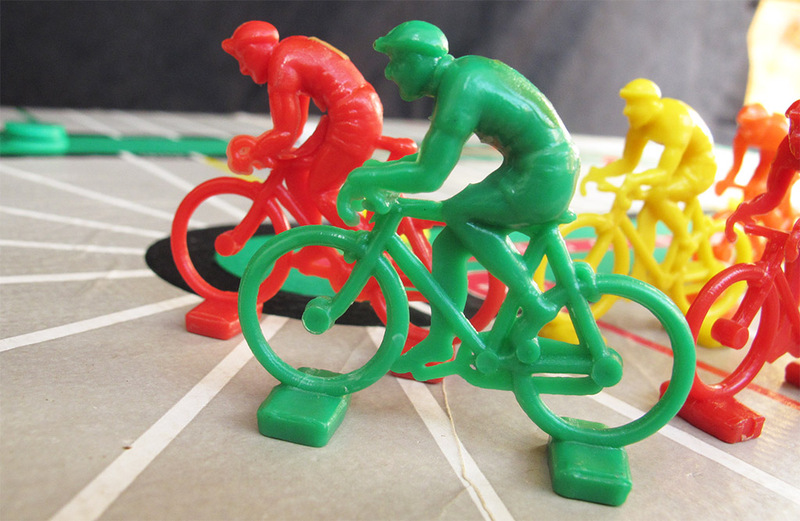 This game has a "King Of The Mountains" classification, but does not have a different rule to move riders on the climbs. There are no climbs as such, just three yellow lines on the board, the third of which is worth more points. The team director's orders. The game is language dependant. 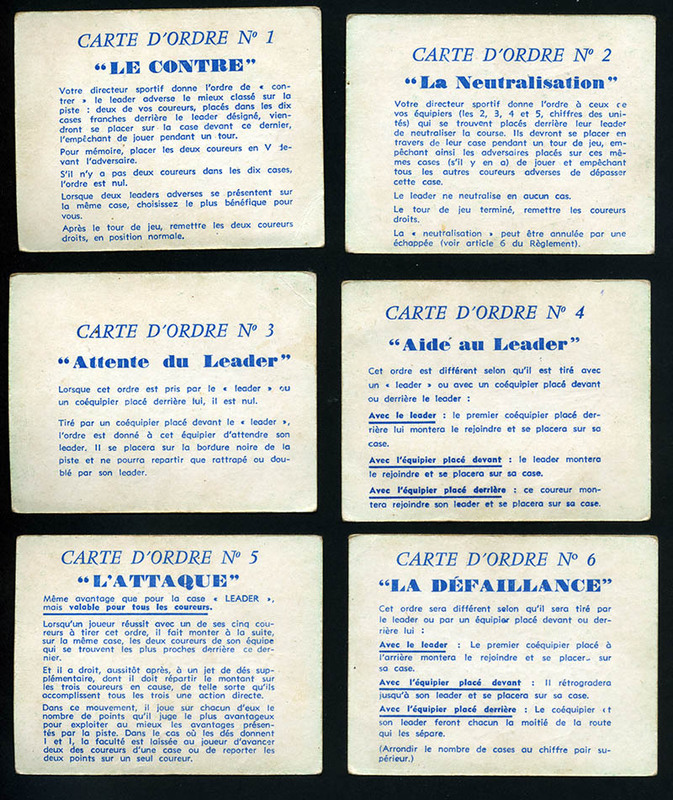 Back of the four decks of order cards. Thanks to Jacques Rolland for keeping this game since its childhood and for thinking that my collection is the best place for the game to be. This kind of things make me really happy.